Psalters containing the 150 Psalms were immensely popular medieval manuscripts, used by a wide array of patrons for liturgical, scholastic and devotional purposes. This lecture explores how the Psalms inspired a rich tradition of literal, historical and interpretative illustration, from the 9th to the 14th centuries, across Europe. 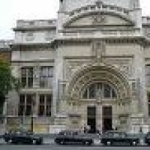 Dr. Sally Dormer has been the course tutor for the Late Medieval and Early Renaissance Year Course at the Victoria and Albert Museum since its inception in 1993 and has lectured there since 1984. She is a specialist medieval art historian and lecturer who gained an MA in Medieval Art History and a PH.D on medieval manuscript illumination at the Courtauld Institute, University of London. All Psalm extracts below are taken from the Vulgate/King James version of the Bible. Psalms were known by their opening phrase, rather than their number in the Middle Ages. Medieval Psalm numbers do not tally exactly with those in modern Bibles since some Psalms have been divided, others combined, in the post-medieval period. The first four verses of Psalm 95 (Psalm 96 in modern Bibles), encapsulate some of the sentiments expressed frequently in the 150 Old Testament Psalms, sentiments that ensured their popularity throughout the Middle Ages. Declare his glory among the Gentiles: his wonders among all people. The Psalmist housed within a C in a 12th-century Glossed Psalter, now in Lambeth Palace Library, London, points emphatically at the opening of Psalm 95 (96). He directs our attention to the Psalm’s opening lines, which, as we have seen, urge the reader to praise God for His glory and extol Him as Saviour and worker of wonders (Plate 1). The 150 Psalms are a collection of canticles, or songs, composed in Hebrew, that were brought together in a piecemeal fashion over a period of seven centuries. The earliest were written as far back as the 10th century BC, when King David, the supposed author of many of them, was alive. No less than 73 Psalms mention David in their titles, and his authorship was promoted enthusiastically, since it elevated the pedigree of the texts. As an ancestor of Christ and a fallible human being, who sinned, repented, and was forgiven by God, David was the perfect role model for all men and women. As you will see, images of David feature strongly in medieval Psalters. During the Middle Ages the Psalms were made available in two main contexts; either as an integral part of a Bible, where they occur roughly half-way between Genesis and Revelation; or as independent volumes, where the Psalms constitute the main content of the book. It is the latter type of Psalter, which often also contained subsidiary texts such as a Calendar, additional Canticles or Biblical songs, and special prayers, which will concern us today. Numerous independent Psalters survive from the 9th to the 15th centuries, suggesting that the Psalms were cherished texts, and there are plentiful references to men and women knowing the entire Psalter off by heart, indicating that they were read frequently. Why were they so highly prized? A selection of Psalters, suggests the main reasons for their popularity and four categories of people who owned and used such books. Scholars, the majority of whom were churchmen, viewed the Psalms as texts that repaid fine-tooth combed study and analysis. Psalters made for scholarly study lack significant decoration and illustration and may include a number of different versions of the Psalms. This 10th-century example from Cologne is a quadruple Psalter. Each page carries four Latin versions of the Psalms, three of which were translated by St Jerome in the late 4th century (Plate 2). TheRoman, on the left, is the earliest Jerome version, translated from an earlier Latin version in c. 384, and the most commonly used up to the 9th century. The second column is the Gallican version, so-named because of its early popularity in Gaul. This was translated from a Greek version, c. 390-405, and becomes most common in the 10th and 11th centuries. It also provided the basis of the Vulgate version of the Psalms used today. The Hebrew occupies the third column, translated from Hebrew in c. 390, a Latin version usually restricted to scholarly Psalters. The textual variants between these three Latin Jerome versions are slight, but significant (see comparative table for Psalm 1 at the end of this document). The fourth column in this Psalter is occupied by a non-Jerome Latin version of the Psalms, and is easily distinguished textually from the other three. All four versions are kept in careful step with one another, in terms of layout, verse by verse, to facilitate easy cross referencing by an investigating scholar. Multi-version Psalters tend to be the exception rather than the rule, but the Eadwine Psalter, produced at Christ Church Priory, Canterbury in the mid 12th century, deserves mention as a Psalter that was intended to contain every possible text related to the Psalms (Plate 3). The Gallican version, on the far right, occupies a broader column of text than the Roman and Hebrew versions to its left, signalling its primacy. But this is not just a triple Psalter. An Anglo-Saxon, or Old English, version of the Psalms occupies the spaces between the lines of the Roman version and a French translation sits in between the lines of the Hebrew version. The arrangement of these five versions of the Psalms must have demanded considerable skill from the designer of the book (probably Eadwine, the monk whose portrait occurs towards the back of the volume), in an age when there was no automated means of tabulating or justifying text. As if this was not enough, the Gallican version here is accompanied by interlinear and marginal commentaries or glosses, written in smaller script. One wonders how this book might have been used and there is the distinct possibility that it was a white elephant by the time it was complete. Ecclesiastics of every kind knew the Psalms intimately. As early as the 5th century Gennade, the Patriarch of Constantinople, refused to ordain clerks who had not memorised the Psalter, and the late 6th-century Pope Gregory I refused to award one of his pupils with an episcopate for the sole reason that he did not know his Psalter. In 653 the 8th Council of Toledo decreed that all ecclesiastics should know their Psalms. The Psalms were divided between the Canonical Hours over each seven-day period so that monks and nuns recited all the Psalms, at least once a week, as part of their celebration of the liturgy. This 14th-century Benedictine kneels before the opening of Psalm 119 (120), a common position for representations of owners or donors of Psalters, in a book that bears his name, the Psalter of Richard of Canterbury (Plates 4 and 4a). Richard (c. 1281- beyond 1334), a monk at St Augustine’s Priory Canterbury, is just one example of an ecclesiastic who must have been fully conversant with the Psalms and who left this Psalter, probably designed for his private use, together with 14 other manuscripts, as a gift to his religious community. Temporal rulers used Psalters as instruction manuals from which they could learn skills of Christian leadership, inspired by the example of King David. Charlemagne’s grandson Charles the Bald, Emperor of the West (r. 875-77), may well have commissioned this Psalter, containing a full-page frontispiece portrait of himself with the blessing hand of God poised above his head, with this purpose in mind (Plate 5). He subsequently presented the book to Metz Cathedral on the occasion of his coronation in 869. The Byzantine Emperor Constantine VII Porphyrogenitos (r. 913-59), made his intentions more specific in the book known now as the Paris Psalter, made in Constantinople, in the mid 10th century, in part for his son Romanos, who became Emperor Romanos II (r. 959-63). One of the prefatory miniatures shows King David flanked by personifications of Wisdom and Prophecy holding a book plainly open at Psalm 71 (72): 1, “O God give thy judgement to the king, and thy righteousness to the king’s son, that he may judge thy people with righteousness” (Plate 6). This very verse recurs in a treatise on the principles of just government that Constantine VII Porphyrogenitos presented to Romanos. The full-page miniature, in the Psalter of Basil II, showing Emperor Basil II, also known as Basil the Bulgar Slayer (r. 958-1025), crowned by Christ, standing upon a bejeweled foot-stool, with his enemies prostrate beneath his feet, would no doubt have reinforced his belief that he was divinely appointed, and ruled with God’s assistance, just like David, his Biblical forebear (Plate 7). Many Psalters contain no specific information regarding their original owners, but in some instances, particularly if a royal or noble patron was involved, images of patrons, or the inclusion of idiosyncratic texts, can reveal, or at least suggest, their identity. Theso-called Shaftesbury Psalter (there is no very good reason to link it with Shaftesbury), almost certainly belonged to Queen Adeliza (d.1151), the second wife of King Henry I of England, pictured here as a suppliant, respectfully beyond the frame that houses Christ in Majesty surrounded by the symbols of the Four Evangelists (Plates 8 and 8a). Her royal status is hinted at by her tiny golden slippers and golden edged sleeves. Her identity is indicated by the inclusion of a prayer to St Lambert of Liège, bishop of Maastricht (c. 635-c. 705), a saint rarely venerated in England, but popular in Louvain, Adeliza’s birthplace. A number of her close male relatives are also known to have been called Lambert. The Luttrell Psalter made c. 1330, contains more explicit evidence. A knight, on horseback, bedecked with his coat of arms, is relatively easily identified as Sir Geoffrey Luttrell of Irnham (d. 1345), a minor Lincolnshire nobleman. He is shown with his wife, Agnes Sutton who hands him his helm and lance, while their daughter-in-law Beatrice Scrope holds his shield. The grand dimensions and lavish illustration of the book indicates that Sir Geoffrey may have regarded his Psalter more as a status symbol and a means of family promotion, than as a book for private devotion (Plate 9). By the early 14th-century most laymen and women said their prayers from Books of Hours, rather than Psalters. Psalters intended as devotional aids were often richly supplied with illustrations, positioned variously within the book: sometimes frontispieces or narrative cycles prefaced the Psalms; sometimes illustrations and/or historiated initials permeated the Psalms; and sometimes illustrations invaded the margins surrounding panels of text. Many Psalter illustrations were inspired directly, or by association, from the words of the Psalms, and their relationship with the words they accompany reveals much about how patrons used their Psalters. From Late Antiquity onwards it was common practice to furnish texts with “portraits” of their authors, and this tradition continued into the medieval period. Psalters often included an image of King David, frequently accompanied by musicians, reminding the viewer that the Psalms were composed as songs. One of the earliest such images occurs in the Vespasian Psalter, an 8th-century product of Christ Church Priory, Canterbury, as a frontispiece (Plate 10). A youthful, clean-shaven David composes and performs a Psalm, surrounded by an appreciative audience of musicians and scribes. By the late 9th century when the Golden Psalter was made at the monastery of St Gall, now in Switzerland, this approach had been enlarged to include a number of illustrations of David’s life; no less than 13 full-page Davidic scenes are interspersed with the text in this magnificent book, written entirely in gold (Plates 11 and 12). Here David sits with musicians and dancers, and is anointed by Samuel. In the Byzantine tradition of Psalter illustration scenes from David’s life tend to be clustered together at the beginning of the volume, prior to the opening of Psalm 1. In the Paris Psalter there were at least seven Davidic scenes in this position originally, including David serenading his flocks with a personification of Melodia at his shoulder, and Samuel anointing him (Plates 13 and 14). By the 12th century it became more common, especially in the West for David to inhabit the initial to Psalm 1, the Beatus initial, so-called because Psalm 1 opens with the phrase “Beatus vir…” (Blessed is the man….). Here David sits in the bottom bowl of the Beatus, in the Melisende Psalter a book made for Queen Melisende of Jerusalem (r. 1131-43), in that city, c. 1131-43, perhaps a gift from her husband, Fulk of Anjou, King of Jerusalem (r. 1131-43) (Plate 15). By the late 12th century, other division initials in Psalters are historiated with scenes from David’s life. From an early date the Psalms had been variously divided into sections, in order to accommodate them within the liturgy; the Psalms at the beginning of each section became known as Division Psalms. The chart at the end of this handout shows the various systems by which the Psalms were divided into sections of varying length. By the 12th century the ten-fold division was most common; a combination of the three-fold and eight-fold division systems, with the Division Psalms as follows: 1, 26, 38, 51, 52, 68, 80, 97, 101 and 109. Different parts of Europe adopted distinctive subjects for the historiated initials of Division Psalms, as a way of distinguishing them from the rest of the Psalms in between. In the English tradition narrative Biblical scenes tended to dominate and David is only associated with particular psalms, such as 26 (27) where the title provides the prompt, “The psalm of David before he was anointed”. The initial to Psalm 26 (27) in the Macclesfield Psalter, a 14th-century book made in East Anglia, and discovered in the library of the Earl of Macclesfield in the early 21st century contains this scene (Plate 16). In the French tradition of Division Psalm initials, David makes more frequent appearances, often related in some way to the first verse of the Psalm. The Queen Mary Psalter, made in the 1320s at Court in London, possibly for Edward II and/or his queen, Isabella (the current title stems from Queen Mary Tudor’s ownership in the 16th century), is English, but steeped in French influence. Thus the initial for Psalm 26 (27) depicts David dramatically pointing to his eye, illustrating literally the first verse of the Psalm “Dominus illuminatio mea et salvus mea” (The Lord is my light and my salvation, whom shall I fear? ), (Plate 17), rather than his anointing. A literal visual interpretation of the Psalms was one of the most common ways in which Psalter illustrations were devised. This could be done simply, or with incredible complexity. One of the most sophisticated Psalters in this regard is the Utrecht Psalter, made in the 820s at the monastery of Hautvillers near Reims. Probably produced under the patronage of Ebbo, Archbishop of Reims, perhaps for Louis the Pious, Charlemagne’s son, and Emperor of the West (r. 814-40), or perhaps his wife, the Empress Judith, the book has a detailed unframed monochrome illustration at the beginning of every Psalm. These illustrations are so adept at communicating the drama of the message and breathing startling life into the text that they have been described as “visual charades”. Psalm 22 (23), demonstrates the approach (Plates 18 and 18a). brought me up on the water of refreshment. the paths of justice, for his own name’s sake. thy staff have comforted me. me, how goodly it is. An exceedingly ingenious mind has translated explicit visual phrases, as well as more diffuse concepts into images woven into a homogenous whole. This has been done with equal complexity for every Psalm. It is hard to know exactly how these illustrations might have been used, but it may well be that they were designed as mnemonic aids, intended to help the reader, perhaps a layperson of limited literacy, to remember each Psalm. Having absorbed the detailed content of an illustration whilst the relevant Psalm was read, a subsequent glance at the picture would have effectively prompted the reader to recall the precise phrases of the Psalm. In the 12th-century St Albans Psalter, a handsome volume made at the instruction of Abbot Geoffrey (r. 1119-46), at St Alban’s Abbey for Christina of Markyate (d. c. 1155), a high born woman who eschewed marriage to become a hermit and a nun, every Psalm opens with a historiated initial. Some are literal visual interpretations of the opening line, others of subsequent verses in the Psalm that follows. For example, Psalm 16 (17) verse 8 provides the prompt, “From them that resist thy right hand keep me, as the apple of thy eye. Protect me under the shadow of thy wings”. A winged Christ protects the Psalmist, who signals our attention to the Psalm text with his left hand (Plate 19). In the Shaftesbury Psalter the opening verse of Psalm 109 (110) has been interpreted literally with amusing results. “The Lord said to my Lord: Sit thou at my right hand: Until I make thy enemies thy footstool” (Plate 20). A third approach to illustrating the Psalter was based upon a typological interpretation of the Psalms. Typology involves juxtaposing an Old Testament event or figure with a New Testament event or person; the former is viewed as a pre-figuration of the latter, and the latter as the fulfillment of the former. This was a familiar approach to the Scriptures in the Middle Ages. Illustrations of New Testament events in Psalters are commonly Christological in focus, unsurprisingly since many Psalms contain prophecies of the promised Messiah, a descendant of David. The Utrecht Psalter illustration for Psalm 15 (16) includes two Christological scenes, the Harrowing of Hell on the left and the three Maries at the sepulcher on Easter morning on the right (Plate 21). Both scenes have been prompted by verse 10 “Because thou wilt not leave my soul in hell; nor wilt thou give thy holy one to see corruption”. In frugally illustrated Psalters Christological frontispieces, often the Crucifixion, were common, since Christ’s sacrifice was the culmination of His Ministry and Passion, and an event alluded to in many Psalms. This no doubt dictated the decision in both the late 10th-century Ramsey Psalter, made for Oswald Archbishop of York (d. 992), and the mid 13th-century Evesham Psalter, which belonged to a Benedictine abbot at Evesham Abbey (Plates 22 and 23). The continuity between the Old and New Testaments, which underpins this approach, is eloquently illustrated in the Beatus initial of Queen Adeliza’s Shaftesbury Psalter. David in the upper bowl of the B gazes upwards, across space and time, towards his descendant, Christ, who presides above, flanked by the four Evangelist symbols (Plate 24). The same intention dictated the frequent insertion of a Tree of Jesse, a genealogical family tree of David’s family, beginning with Jesse his father and culminating with Christ, for Beatus initials, as in the 14th century Gorleston Psalter (Plate 25). These examples are compact versions of the most popular approach to illustrating the Psalter from the late 11th century onwards. Christological imagery was emphasized by inserting extensive prefatory cycles of Christ’s life prior to Psalm 1. The earliest example of this in England occurs in the Tiberius Psalter, produced just before the Conquest in Winchester. The book opens with 16 full-page drawings, comprised of five Davidic scenes and 11 scenes from the life of Christ that concentrate upon his Passion, such as the Crucifixion and Harrowing of Hell (Plates 26 and 27). This system of illustration was revived and developed seventy years later at St Albans Abbey in the 1120s when the St Albans Psalter was made. Christina of Markyate’s book opens with a prefatory cycle of 32 full-page, fully painted miniatures, the first such prefatory cycle produced in England, consisting of three Old Testament and 29 New Testament scenes spanning Christ’s Infancy, Ministry and Passion, painted by an artist known as the Alexis Master (Plates 28 and 29). A prefatory cycle like this turns a Psalter into a picture book, perhaps signalling that they were intended for patrons of limited literacy, such as Christina may well have been. She will no doubt have enjoyed looking at the copious illustrations that adorned her Psalter, as well as learning from them. The 14th-century Queen Mary Psalter is equally suited to a patron who was more comfortable with pictures than words. In addition to an illustrated calendar, historiated division initials, over one hundred and twenty pages of prefatory Old Testament illustrations, and bas de page scenes on every page, this lavish book has a cycle of framed Christological miniatures woven throughout the Psalms, beginning at Psalm 1 with the Annunciation and continuing through Christ’s Ministry and Passion until the Last Judgement. Here the Baptism at the opening of Psalm 80 (81) and his first miracle at the Marriage at Cana when water was transformed into wine, at the opening of Psalm 68 (69) (Plates 30 and 31). The majority of Psalter illustration falls into the categories we have considered so far in terms of their relationship with the text. But in a small number of Psalters, text was interpreted pictorially with reference to historical events, public or personal. The mid 9th-century Khludov Psalter belongs to a group of Byzantine Psalters known as Marginal Psalters. These books were designed with particularly ample margins to position illustrations as close as possible to the verse that inspired them. This small volume was produced at the monastery of St John Studios in Constantinople, home to a community vociferously opposed to the ban on figurative images of holy figures, including Christ, the Virgin and Saints, that had been imposed in the Byzantine Empire from 726-843; the period known as Iconoclasm. The monks at St John Studios made this Psalter soon after 843, partly, it seems, to celebrate the triumph of the Iconodules against the Iconoclasts. These two illustrations to Psalm 68 (69) illustrate the rich layers of meaning that could be extracted from a Psalm (Plates 32 and 32a). At the top of the right margin, a Christological scene, Christ on the Cross is offered a vinegar-soaked sponge. The man offering the sponge is shown with his head in grotesque profile, a medieval device for depicting evil men, in this instance a Jew. Often interpreted as a charitable act, intended to assuage Christ’s thirst, the vinegar was meant to revive the dying man thereby prolonging the agony of death. This image has clearly been inspired by verse 22 of the Psalm “And they gave me gall for my food, and in my thirst they gave me vinegar to drink”. In the bottom margin a wild-haired man daubs an icon, or likeness, of Christ with a sponge dipped in whitewash in an attempt to erase it. An inscription identifies him as John the Grammarian, Patriarch of Constantinople (r. 837-43), who was an ardent supporter of Iconoclasm. His erasure of Christ’s image is therefore visually equated with the cruelty of the man who tortured Christ. The Patriarch’s unkempt hair signals his lack of holiness, and given the fervour with which the Studios monks repudiated Iconoclasm, and celebrated its demise in 843, it is likely that the sentiments of verse 28 of Psalm 68 “Let them be blotted out of the book of the living; and with the just let them not be written”, made with reference to the Psalmist’s foes, were extended to refer to all Iconoclasts. In the Khludov Psalter historical events are shown explicitly; in other instances the approach was more subtle, cloaked in what might appear initially as a literal interpretation of the Psalm text. The illustration for Psalm 50 (51) in the Utrecht Psalter is directly sourced from verses 2-4, “When Nathan the prophet came to him (David), after he had sinned with Bathsheba. Have mercy on me, O God, according to thy great mercy. And according to the multitude of thy tender mercies blot out my iniquity. Wash me yet more from my iniquity, and cleanse me from my sin.” (Plate 33) Nathan is shown gesturing dramatically towards David on his right. David stands awkwardly, caught literally between God’s messenger and Bathsheba, the wife of Uriah, with whom he has committed adultery. Bathsheba’s husband, sent into the front line of battle by David, lies prone, directly beneath the guilty couple, blood pouring from his mouth. If this book was made for the Emperor Louis the Pious, or his wife Judith, this picture may well allude to a nearly contemporary event as well as the obvious Old Testament story. Louis had become embroiled in controversy with the church when he decided to marry Judith in 819 after the death of his first wife. Some churchmen opposed the alliance, and it is possible that this illustration, set at the beginning of one of the seven Psalms known collectively as the Penitential Psalms (their central message is man’s need for repentance and God’s assurance of forgiveness), was meant to admonish Louis or Judith, and encourage repentance for a personal sin. Sometimes the link between Psalm text and accompanying image is less specific, forged only by a loose sense of association. The bas de page scenes in the bottom margin of almost every folio in the Queen Mary Psalter are not directly connected to the text above, but are definitely linked, in spirit, to the function of the Psalter. Many of consist of popular saints’ lives, such as Thomas Becket; here the marriage of his parents (Plate 34). Saints presented the users of Psalters with a blueprint for how to live a holy life, and encouraged them to emulate the saints by regular prayer and devotion, i.e. by using their Psalter. Not all Psalter marginalia is as easily interpreted. Psalm 38 (39) in the Macclesfield Psalter opens with an historiated initial, filled, following the English tradition, with Saul sending Doeg the Edomite to kill the priests of Nob, a literal illustration of the Psalm title (Plate 35). But who are the three secular figures, a man on horseback, a woman holding a lap-dog and a naked wild-man, beneath? Their arrangement mirrors that of the three Biblical figures in the initial, and the gestures of the rider and the wild-man imitate those of Saul and the soldier closely enough to indicate that the two scenes are linked in some way. But there is nothing obvious in verse 2 of the Psalm, directly above the lower trio, to account for their presence. This reads “I said: I will take heed to my ways: that I sin not with my tongue. I have set a guard to my mouth, when the sinner stood against me.” Could this be a visual reference to an as yet unidentified secular romance selected with moralizing intent? It is difficult to be sure. A little further on in the Macclesfield Psalter this marginal image of a little man backing away in horror from a gigantic skate can perhaps be interpreted on a number of levels, demonstrating the complex approach to illustrating the Psalms (Plate 36). Taken at face value it is simply playful, an image that would have distracted the reader for a moment from the hard grind of saying his prayers and prompted a smile. The skate must surely indicate the artist’s familiarity with fish caught off the East Anglian coast, where skate abounds to this day. Look more closely and a textual justification for the scene emerges. Psalm 45 (46), verse 3 (directly above) reads “Therefore we will not fear, when the earth shall be troubled; and the mountains shall be removed into the heart of the sea.” This scene is intended to comfort the reader, to reassure him that nothing, even the prospect of confronting a giant fish (prompted presumably by the reference to the sea in the verse), is too big a problem for God. To conclude, the Psalms are endlessly fascinating texts, and illustrated Psalters, better than any other type of medieval book, provide us with the chance to admire the multiplicity and ingenuity of approaches employed to forge links between texts and images in the Middle Ages. Psalters were much more than picture-books, even if their owners were sometimes tempted, as we are today, to regard them as such. 18a. Detail of plate 18. 51 51 Quid gloriaris in militia…. ?